The Staatliches Hofbräuhaus in München (public Royal Brewery in Munich, also Hofbräu München) is a brewery in Munich, Germany, owned by the Bavarian state government. 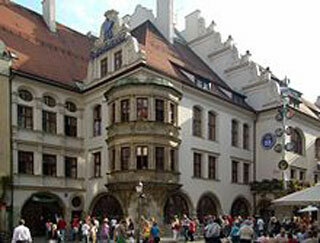 The Hof (court) comes from the brewery's history as a royal brewery in the Kingdom of Bavaria. The brewery owns the Hofbräuhaus am Platzl, the Hofbräukeller and one of the largest tents at the Oktoberfest (Hofbräu-Festzelt). There are many types of beer brewed using original recipes handed down by Wilhelm V, the Duke of Bavaria. The current beers produced include a Weißbier and Helles, Maibock, Dunkel and Oktoberfest lagers. The Hofbräuhaus am Platzl in Munich inspired the song "oans, zwoa, g'suffa" (The Bavarian dialect for: "one, two, down the hatch"). This article uses material from the Wikipedia article "Staatliches Hofbräuhaus", which is released under the Creative Commons Attribution-Share-Alike 3.0 License.